The recording features Rouse’s Third and Fourth Symphonies (the Fourth was commissioned and premiered by the Philharmonic for the inaugural NY PHIL BIENNIAL and called “skillful and mature … the best Rouse I’ve heard in 20 years” by Musical America), Odna Zhizn (commissioned and premiered by the Orchestra), and Prospero’s Rooms (commissioned and premiered by the Philharmonic, and dedicated to Alan Gilbert). Buy the CD here, or check it out on Spotify and iTunes. Catch this year's biennial World Premiere with Alan Gilbert and the New York Philharmonic: William Bolcom's Trombone Concerto, with Principal Trombone Joseph Alessi as soloist, June 10. "Spring for Music opened on Monday evening at Carnegie Hall with a powerful performance of Christopher Rouse’s Requiem by the New York Philharmonic and the Westminster Symphonic Choir, conducted by Alan Gilbert," The New York Times review began. "[I]t is hard to imagine Mr. Rouse’s work receiving a more rapt reception — or a more passionate performance..."
Alan Gilbert directed this flow of musical traffic, ensuring a smooth switching between these interacting blocks of sound, building one upon another like the alternating sections of a Bruckner chorale. The work came to a soft, redemptive close with a soft final statement of the Requiem theme. The applause that followed was another welcome, percussive roar of sound. Conductor Alan Gilbert conducted this New York premiere with his usual aplomb, care and actual excitement. Without that excitement, in fact, the Rouse Requiem might have been a lament only for the dead, rather than the very living participants. Listen to WQXR's archived audio stream. Philharmonic veterans could perhaps be excused for feeling a bit blasé about yet another appearance in Carnegie. But Mr. Gilbert, the music director, is having none of that. Mr. Gilbert will finally take on Christopher Rouse’s Requiem, a big, long, difficult work and a project he has been toying with for several years. The orchestra will be joined by Jacques Imbrailo, a baritone; the Westminster Symphonic Choir; and the Brooklyn Youth Chorus. The work had its premiere in 2007, presented by Grant Gershon and the Los Angeles Master Chorale and Orchestra, and has not been performed since. The ASIA / WINTER 2014 tour came to a triumphant conclusion this week with a concert in Yokohama and two in Taipei. Joining Alan Gilbert and the Philharmonic for brilliant concerto performances were new and longtime friends: jazz sensation Makoto Ozone; pianist Yefim Bronfman, the Philharmonic’s current Mary and James G. Wallach Artist-in-Residence; and violinist Lisa Batiashvili, who will succeed him next season. After two weeks, ten concerts, six cities, and three countries, the Orchestra headed back to New York to resume performing for their hometown audience. The Philharmonic's week in Tokyo was packed with performances: a concert for families featuring Alan Gilbert narrating Britten's The Young Person's Guide to the Orchestra in Japanese and the Orchestra playing music by 10- to 15-year-old composers from New York and Fukushima; concertos with jazz pianist Makoto Ozone, Artist-in-Residence Yefim Bronfman, and violinist Lisa Batiashvili; and the Principal Woodwind Quintet in chamber music at the Residence of the U.S. Ambassador to Japan, Caroline Kennedy. Alan Gilbert made Tchaikovsky’s Fifth feel “bespoke and modeled with style,” The New York Times said of Thursday’s concert. Smith noted how rare second or third hearings of major new works are, adding: "credit, then, goes to Alan Gilbert and the New York Philharmonic, who have provided a chance to hear" the Lindberg concerto again. The Financial Times' Martin Bernheimer echoed this: "Alan Gilbert, a maestro who plays by his own rules, apparently doesn’t care [that second performances are rare]." 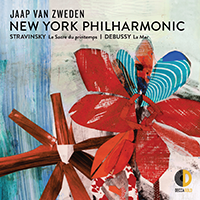 Alan Gilbert and the New York Philharmonic’s recording Steven Stucky, Christopher Rouse, Ives is fourth on Rhapsody’s Top 25 Classical Albums of 2013.